This morning, prescription digital therapeutic developer Click Therapeutics closed a $17 million funding round led by Sanofi Ventures, a subsidiary of pharma giant Sanofi. As part of the deal, Davitian will be joining Click’s Board. The latest funding is expected to help the company work on its proprietary platform and the pipeline of its digital therapeutics. Currently the New York-based company is working on digital prescription therapeutics for depression, insomnia, acute coronary syndrome, and chronic pain. The plan is to go through the FDA process and get clearance for these software programs as Class 2 medical devices. “The Click Therapeutics team is proud to partner with Sanofi Ventures to advance our pipeline and expand our product portfolio of prescription medical treatments,” David Benshoof Klein, cofounder and CEO of Click, said in a statement. “As we announced last summer, in 2017 we expanded our collaboration with Magellan Health to pursue regulatory clearance from the FDA for indication-specific prescription digital therapies, leveraging the industry-leading suite of intellectual property and data from Magellan’s existing software as well as their vast coverage and reimbursement leadership. Click Therapeutic and collaborator Magellan Health have seen some recent wins. In June multiple publications came out validating Click Therapeutic’s digital offerings that are designed for people with major depressive disorder. The studies, which were published in npj Digital Medicine, the Journal of Affective Disorders, showed that the therapeutics reduced symptoms, paired well with transcranial direct-current stimulation and invoked a clear neurobiological mechanism related to cognitive control and emotion processing. 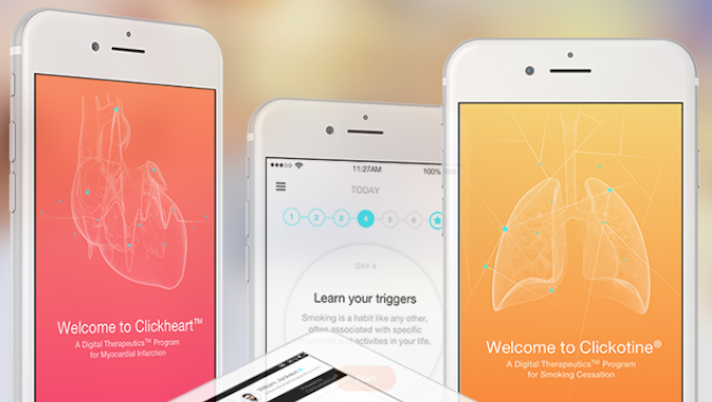 Sanofi has shown an active interest in digital health over the last few years. In May Sanofi’s Vice President of Digital Business Development and Licensing Rachel Sha talked to MobiHealthNews about the company’s approach. While the company has a broad digital strategy, it is looking specifically at two areas: drug discovery and development and what Sha calls “drugs plus”, ways in which hardware and software can be bundled with drugs and improve outcomes. The company is also actively teaming up with startups, like Click Therapeutics, and tech companies in order to bring those innovations to the company.